When Don Tapscott (Wikinomics) profiled the audience at #GES2013 , he never asked if anyone is from the NGOs. How sad. We are a demographic. Girl in front of me reading her conference schedule out loud making me confused whether I need to respond to her or not. Two quotes from Melody Hossaini – “Women are leading in business.” “Future of business is social enterprise.” Gonna bombard you with Qs! OMG, I want to puke everytime this person speaks. Selalu off track. …Apa la mamat ni melalut??!! Ya rabbi. Your answers tak akan pernah menjawab mana-mana questions. #2minsolo Suaka – I think post Panggung Muzik, Fikri Fadzil have found his niche, real live soundtracking. It works to his favour. #2minsolo Can You Hear Me – It makes you curious on what’s going on in Ngai Yuen’s head but Carmen Soo performed it brilliantly. #2minsolo A 2-min Introduction to Vasthu Sastra by Mr. Selva – An interesting piece. Mr. Selva looks very biblical, not so fengshui-ish. #2minsolo Lights, camera…..! – Such a moving piece! Thank you Aunty Fati … This is the first piece I watched and I can still feel it. #2minsolo Slimy Seaweed – I’m a bit lost except that I do understand the road is very congested in front of IJN. Grief relives moments. #2minsolo Tumpah! – Zahim attempts a very improv interactive performance in his piece. It’s almost what we would do at his kitchen anyway. #2minsolo Toilet – A very heartfelt piece directed by David Wong. 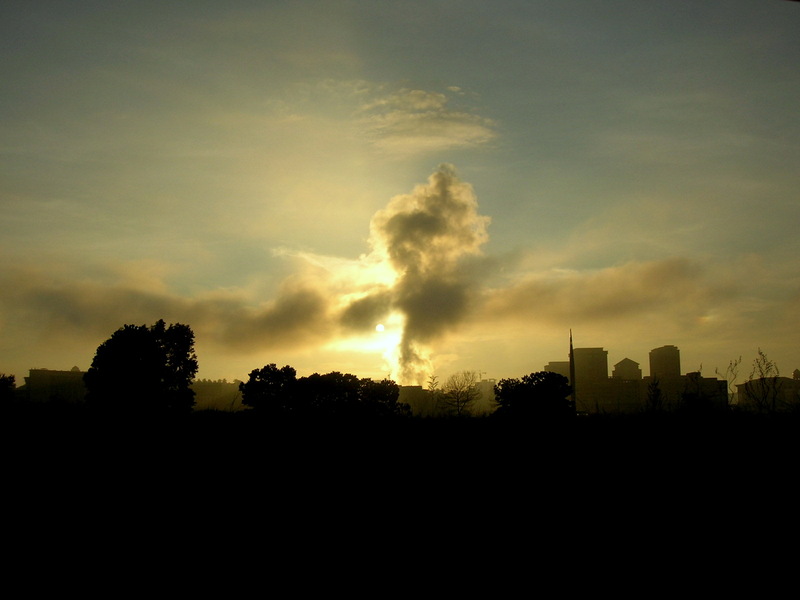 Cities are built by perseverance, dedication and the need to survive. #2minsolo I Fly To Thee – is a submission of his prayers. Good luck, Vernon. Blessed be. #2minsolo Cengkih – I wished the performer acts like a storyteller and looks at the audience when she was reminiscing memories of grandma. 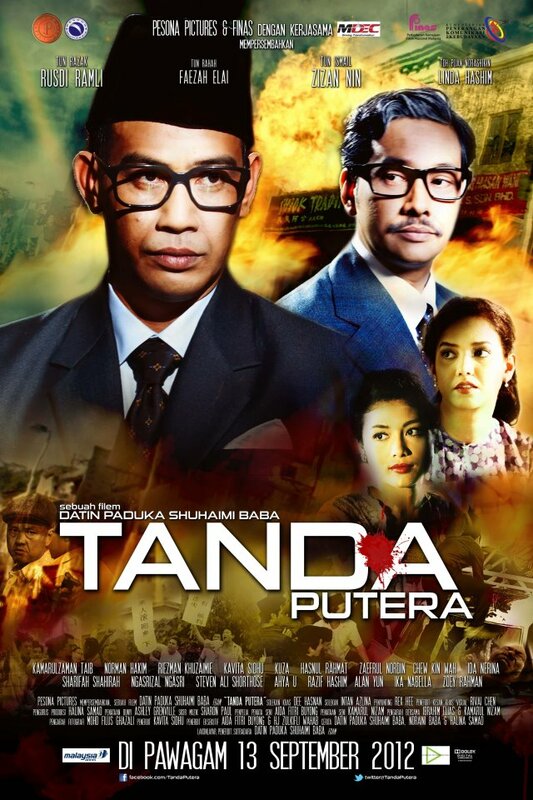 I wished Tanda Putera should just focus on the friendship of Tun Razak and Tun Dr. Ismail and their families. Then it’ll be more impactful. I suggest you watch it soon. Very pleased to watch a lot of footages the public never get to see from the archives. Another feel good Sunday spent with @faizakhbar over projects, chats on films and dinner. Now I know the history of Babel. So, I was telling him how I wanted to write a story about Jentayu and we were talking magical realism, then we talked about Deepa Mehta’s Midnight Children and then it went to Babel. First, I didn’t know that Babel was the third installment of a trilogy by Alejandro González Iñárritu after Amores Perros and 21 grams. 21 grams is of course my favourite. Faiz was telling me the underlying link for all the stories in Babel is misscommunication. And then he goes on telling me the history of Babel. I looked it up as well and became fascinated that how the tale of the Tower of Babel talks about how human race was divided and languages were created from this historical event. Whether it happens or not, that is beside the point. The point it how it was interpreted in the film. I kind of like the movie, Babel. I had to watch it 2 times because apparently I’m not so smart (as I thought/appear to be). But what intrigued me most is that how can we interpret an ancient story into modern lives. Which is what I wanted to do with Jentayu. I’ll take my time writing it. After all, I’ll only die when I reach 40. That’s 9 years for me to create this magic. What’ll Break You? Maybe the Apocalips. The world as we know it, will end. That was the Apocalips, as interpreted by playwright Ivan Yeo in a double bill play I went to last Friday night. Double bill because it is a two-play combo, first you have What’ll Break You and after the intermission, the second play, Apocalips. Indeed a smart thought out interpretation by director Ida Nerina to have two plays at one night, both thought provoking and heart wrenching. Okay, heart-wrenching should not be a suitable word for What’ll Break You because I didn’t cry, but the performance by Zahim Albakri was indeed heart-breaking. What’ll Break You sits in the interrogation room with Mr. Whiteacre (Zahim Albakri) and his said attorney Kevin Schmidt (Gavin Yap). Quite an emotionally draining performance by Zahim although I couldn’t really grasp Kevin Schmidt’s character in this one. One moment there was compassion and the next, quite stone cold. But if you’re used to watching CSI or Crime & Investigation TV series, you would definitely imagine the quality and standard of Ivan’s writing at par with any Hollywood products. You can tell by the very short review I’ve just made, I’m not someone from the production or theatre industry. But I would like to congratulate Ivan Yeo for his brilliance and I wish, his works will get a space in our television because of the lack of English TV productions in Malaysia of late. I remember meeting him at the Kr8tif Digital Conference in December last year, introduced by a mutual friend. Didn’t know then, I was in the presence of greatness. But I guess that’s humility. As the divinity lies in the smallest thing, greatness lies in the presence of the unknown. Q: Is this your first time directing a full length theatre? I know you have directed some comedy sketches for Actorlympics. But how is this different from the ones you’ve been involved with (as behind the scenes)? IDA: No it’s not, I first did a director’s workshop being mentored by Joe Hasham and the late Krishen Jit & directed a Jit Murad piece called VISITS. I had 3 female actors- all brilliant! Melissa Saila, Liza Othman & Sofea Jane! I know…like WOW, right? 😉 About a year later (circa 2003?) I re-staged VISITS as a full production under Zahim & Jits’ theatre company DramaLab. This time I had Liza Othman, Vanidah Imran & Sarah Shahrum. Jealous yet? In March this year, I put together 8 writers, 8 stories, 16 WOMEN actors (ALL SUPERSTAR NAK TERMAMPOS!) doing about 8 minute pieces each for Capricomm for the 100th International Women’s Day. It was So much FUN! I guess the difference with this piece is I have testosterone involved with the 4 guys. Plus it’s my first venture to learning the ropes of co-producing under my little company “big EyEs Entertainment” with Susan Lankester’s company Catwoman Productions. (It’s all about the money, money, moneyyy…- LOVE that song!) FYI, there is NO direction in Actorlympics- it’s all off the cuff. A series of improvs. No script. Nothing. Even the ideas come from the audience! Q: How was the cast selected? We know some are your friends, but were they picked to suit the characters based from the scripts? I always wonder how theatre casts are selected. Q: I really like the twist in Apocalips, did you put any adjustment or personal input in it or its all from the playwright’s script/story? IDA: The writer. We had minor adjustments made of course, but it’s otherwise from Ivan’s head. I just made it farcical. Q: This, I heard, is Ivan Yeo’s debut as a playwright. How did you find him or how did you come across the script? IDA: It’s Ivan’s first PLAY. he’s written short films and tv shows… I’m not sure if he has had any of them produced though. He’s got a twisted, quirky, brilliant mind. LOVE! Q: The first play, What’ll Break You seems quite short, although quite heavy. I would love to see it interpreted on screen. Would you venture into that? Usually, movies are adapted into plays. But do you think Malaysian audience or even the theatre people ready to adapting plays to screens? IDA: Yes, I would. But let me get over this first. Well, Zahim just adapted Jit Murad’s “Spilt Gravy On Rice” into a big screen flick. And from what I’ve seen, it looks pretty damn good! Actually Jit (and Ivan)’s writings read like a film. It’s been up to the directors to translate them for theatre… Re: What’ll Break You/Apocalips, Ivan and I (& hopefully Sue too!) actually want to take them to singapore… Must find the other Ivan in my life then… Ivan Heng of WildRIce. (Ida, eyeing for Ivan Heng, huh? 😉 ) Well, I hope you guys who are reading gets to learn a lot from the production as I have when I got the answers to my questions. Please please please go and watch it for yourself. And no, I’m not paid to do this review and promote the play(S). As artists, we crave recognition. And I think they’re as good and deserving of such praises and recognition. 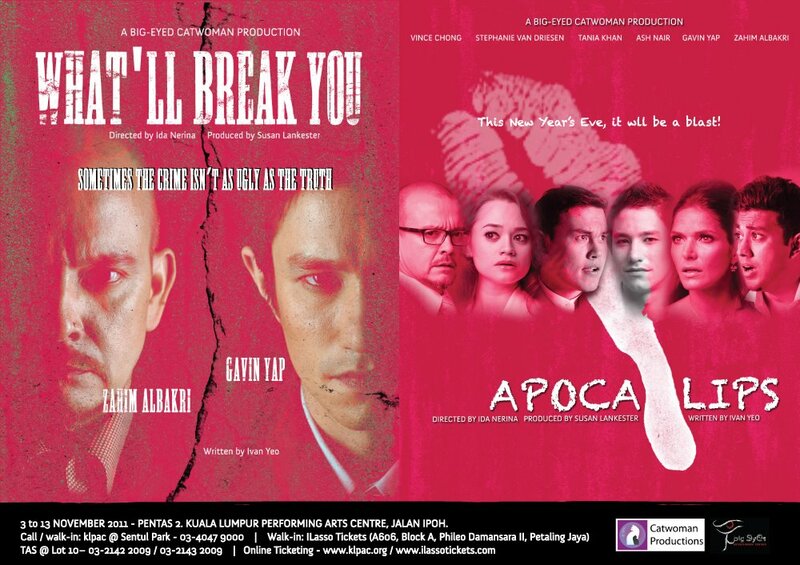 What’ll Break You / Apocalips is currently being staged at KL Performing Arts Centre (KLPac) from 3rd November until 13th November. Call 0340479000 to book your tickets today! I guarantee you, it’s totally worth it!